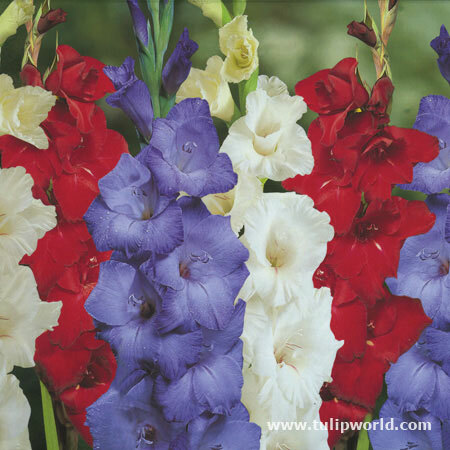 Show your American pride with this wonderful Gladioli mix! This mix contains (6) bulbs each of the following varieties: Oscar (red), Madonna (Blue), and White Prosperity (White). The flower stems can hold as many as 10-14 blooms per stem, making excellent cut-flowers! Symbolize beauty, moral integrity, faithfulness. Birth month flower for August! Used for 40th Wedding Anniversaries.